Oath Keepers, Three Percenters, veterans, bikers, and other patriots,Our Louisiana Oath Keepers chapter is deploying to New Orleans to help defend free speech and also to defend the Civil War monuments from illegal destruction by Anti-fa and other radical leftists, who have threatened to tear down the Robert E. Lee statue tomorrow, Sunday May 7. In particular, we are sending some of our most experienced retired police officers and military veterans from Louisiana, as well as some of the same Oath Keepers police and special warfare veteran leaders we sent twice to Berkeley, CA - men who are very experienced at shutting Anti-fa down. They can use your help, if you are of the right mindset and capability to be a "hands on" defender and are within driving range such that you can get to New Orleans by 11am tomorrow morning. If, so, please show up to help defend. Yesterday we sent out an alert email to our members in nearby states, asking them to come help, but this is now a public call to action to all patriots, whether you are a member of Oath Keepers or not. We apologize for the short notice, but this is a fluid situation and we also have eyes on Baton Rouge, which is at risk of civil disturbances as well as being at risk of active shooters as we already saw there last year. In New Orleans tomorrow, we are focusing our effort on protecting the Robert E. Lee statue and the protesters who are supporting its preservation, but we will be keeping an eye on all of the monuments and all of the protesters, and we will be particularly focused on protecting people from assault and batter by the radical leftists. If you can make it, please rally at the New Orleans WWII Museum back parking lot (to the rear of the building) at 11am. Please meet on the NW corner of the large parking lot for the museum at the intersection of Magazine St. and Andrew Higgins. See this map. Look for men in Oath Keepers hats. The WWII Museum is very close to Lee Circle, about a block and a half East. Expect to then go out on duty at 11:30 am, to protect the protesters who are advocating for the preservation of the monuments, and to protect the monuments themselves from unlawful destruction by Anti-fa and allied Marxist groups. You may end up at different monuments, or different points between depending on the situation on the ground. Obviously those who are physically capable and can handle themselves well, while remaining calm under pressure, are most needed. You don't have to be a retired cop or infantry veteran, but you do need to know how to defend yourself and others effectively, and being able to work well in a team is also critical. Emergency medical, and emergency communications personnel, as well as fire-fighters, are also most welcome and very much needed. If you cannot make the 11am rally time, then please go to the same rally point when you do get there, and we will have someone there to help you get to where you are needed most. Helmet. At least a bike helmet, or baseball helmet, but bring a PASGAT or MICH ballistic helmet if you have one. This is critical as Anti-fa is known to use sticks, clubs, bike locks, etc as well as to throw bricks, rocks, D-cell batteries, etc. Ballistic goggles, that can also help keep pepper spray out of your eyes. Elbow and knee pads if you have them, and shin guards and a cup if you can get them. Mouth piece or some sort of face shield or cage on your helmet if you can. Good boots. Steel toe boots are great for protection, or whatever you can move well in for long periods. N-95 or similar particle mask to help filter out ambient pepper spray in the air. Body armor. If you have it, wear it. Soft armor, hard plates, or both. Good to protect against many threats. Fire-resistant clothing, such as Nomex, cotton, or wool. Wearing synthetics like polyester is not advised as it melts to your skin. Anti-fa is know to use Molotov Cocktails as well as M-80s. Long sleeve shirts and long pants recommended. Radio. At least a set of FRS radios (the kind you can get at any Walmart or other sporting good store). Or a Dual Band HAM radio if you have one. Ear protection. Anti-fa likes to use bullhorns and loud fireworks. Camera. Film any altercation or confrontation. Food bars or other way to keep going all day/night. All weather gear. Be prepared for rain. IFAK. With focus on blood loss trauma. Boo boo kit, and any medications you may need. Sleeping bag/pad in your vehicle in case you need to sleep in it or someplace improvised. NOTE ON SHIELDS AND FLAG POLES. We are now hearing from the New Orleans Parish Sheriff's office that shields and poles of any kind will not be allowed. They will be considered "inciteful" as in inciting a riot. We are trying to confirm, but it is likely accurate info. We don't agree with that, but you need to know. If you have shields and flag poles, and want to bring them just in case, then leave them in your vehicle until further notice in case that changes. This is similar to what we had to deal with in Berkeley, and we still got the job done wearing helmets and good protective gloves. COMPLY WITH FIREARMS LAWS: Please be aware that you will need to be in compliance with all state and local laws on the carrying and use of firearms. Louisiana is an open carry state, but there are prohibitions on being armed near schools, near bars, etc, so be sure you look into the applicable laws and comply with them. We advocate strict compliance to avoid being arrested. You will need to be responsible for your own compliance with applicable laws. Obviously retired police officers have more leeway when it comes to carrying weapons, in general, because of their national concealed carry ability under LEOSA, but they too will need to be sure they are up to speed on the state and local laws as they bear on LEOSA carry and make sure they are carrying legally. If you are a retired officer who will be attending, please let us know by emailing us at la@oathkeepers.org and/or by identifying yourself as such to our leadership team on the ground. As we did in Berkeley (and other places before and since) we will task our retired cops with helping liaison with the local police and, together with our special warfare and other infantry veterans, to help provide competent tactical advice and leadership on the ground to the other patriots who are coming to help. Ultimately, we are only really in command of our own men, but we will do what we can to provide sound advice to other groups and individuals in attendance, as we always do within our CPT program (Community Preparedness Team). Our police officers and special warfare veterans will also be tasked with watching for lethal force "kinetic" threats, both IED and active shooters. The City of New Orleans has decided to remove the monuments, but the Louisiana State Legislature is now debating a bill to preserve the monuments. One version of that bill has already passed the House. It is up to the people of Louisiana, through their elected representatives, to decide whether the monuments should remain where they are or be moved somewhere else. It is not up to Anti-fa, communists, or other radicals to take the law into their own hands and remove the monuments. It is also the right of the people to peaceably assemble and advocate for the preservation of the monuments without being assaulted by the radical leftists, who have already carried out assault and battery and are threatening more, just as they have done across the nation against speech they do not like - using terrorism in the form of violence or threats of violence to shut down free speech and assembly. Oath Keepers deployed some of our most experienced police and military veterans to Berkeley, CA twice - on April 15 and again on April 27 - to stand in defense of free speech. 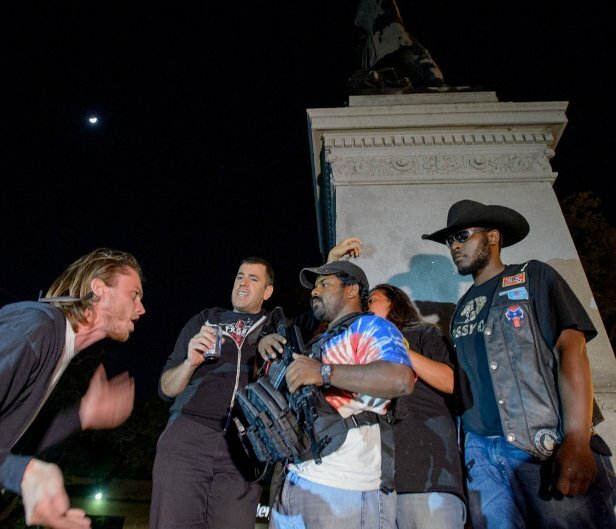 As part of a coalition team of groups, which included bikers (from Two Million Bikers, and then from Bikers for Trump), Three Percenters, American Civil Defense, Proud Boys, and Kyle Chapman's followers, we successfully shut Anti-fa down on both occasions and prevented them from harming any of the speakers or attendees of those rallies. It was a 100% shut-down of Anti-fa and a 100% victory for free speech. And it was made all the sweeter when we saw the Berkeley PD finally step up and bring their "A" game on April 27. We are confident that we can do so again in New Orleans where a similar coalition of groups is coming together. And while we hope to see the New Orleans PD and sheriff's office bring their "A" game as well, we are ready to defend liberty if they don't. There are already brave patriots such as Black Rebel there in New Orleans protecting themselves, each other, and the monuments against unlawful terrorism and vandalism, and more are on their way. When it comes to protecting the protesters who are standing in defense of the monuments and advocating for their preservation, we will be focusing on protecting Black Rebel and his team-mates as they are there for all the right reasons - to preserve our shared history and culture, and to show respect for veterans and our war dead, including the Confederate war dead. As veterans, we believe all veterans, including both sides of the American Civil War, and all of our war dead, deserve respect, and their monuments deserve to be preserved and defended. This is not a defense of slavery. It is a defense of our brother veterans, who are all Americans, whether they wore blue or gray. They deserve respect. And we are duty bound to defend their honor. Black Army Ranger Hall of Fame warrior (and Oath Keeper) MSG Max "Mad Max" Mullen (RET) spoke of this brotherhood in a speech he gave three years ago in Georgia, describing how he was out walking and passed a confederate grave. He stopped and saluted that Confederate soldier's grave, "out of respect, from one soldier to another," because that was an American soldier who was laid to rest there. That is honor, decency, and the brotherhood of the veteran which transcends all. And that is why we will be in New Orleans tomorrow. Andrew Jackson, Robert E. Lee, and General Beauregard were all commissioned officers of the U.S. Army. They are brother veterans. And Jackson not only saved New Orleans from the British during the war of 1812, he later became President of the United States. It is truly Orwellian that the radical left seeks to wipe their memories from our history and from our land. What will be next? The tearing down of the Washington Monument and the Jefferson Memorial because they were slave owners? This needs to stop, and all of us veterans, black, white, and brown, need to stand up and lend our voice and our hands to the defense of our common history and respect for our brother veterans. It is no secret the the communist left and so-called "anarchists" hate this nation, hate our flag, hate our military, and hate all veterans. They openly fly the Soviet flag, and burn ours. This is not really about the Stars and Bars, this is not really about slavery. This is about destroying this nation so they can replace it with their communist "utopia" which would end as communism always ends, in dictatorship, mass slavery, mass starvation, and mass murder. Stand now, or kneel forever. PS- One of the reasons this call to action is such short notice is that our Louisiana chapter has been focused for months now on possible civil unrest, arson, and terrorism in Baton Rouge when the DOJ decision on the Sterling shooting came out. They have been working hard to outreach to the police, to local black and white pastors and to all the veterans of Baton Rouge, both black and white, to encourage them to come together and defend their town against direct threats to burn it to the ground. In the event of civil unrest, our Baton Rouge chapter has also pledged to protect police families while the officers are out doing their job (under our Operation Family Safe and Operation Back Our Blue), to directly protect fire fighters as they fight fires as well, and are also fully committed to defending local businesses and homes against arson, just as we did during the Ferguson riots in 2014. We fully support the right of protest and to peaceably assemble, but we cannot abide deadly arson and violence in the name of "protest." We were already committed to dealing with these possible deadly threats in Baton Rouge, but once we got a call from Kyle Chapman asking us to help in New Orleans, and in particular asking for an advisory team to assist his volunteers who are coming in from out of state, we knew we had to act in New Orleans as well. We apologize for the late notice, but keep in mind that this is the nature of things in this nation, with the far left coming unhinged and doing all it can to set this nation alight with destruction, and to divide and conquer the American people by pitting them against each other. We will have to be fluid, flexible, and ready to adapt and overcome on short notice, especially in our home states, but also in our nearby states when they call on us for aid. Be ready to be the modern day minutemen who answer the call, as your forefathers did. It's what we "Sheepdogs" do. God bless you, and God bless America.